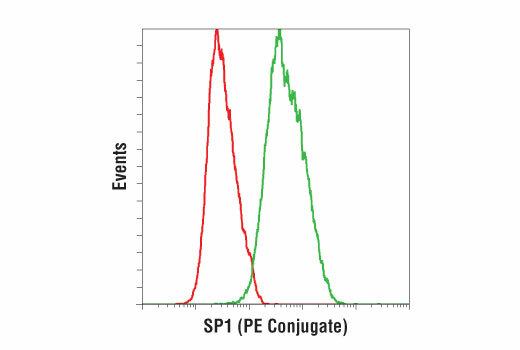 Flow cytometric analysis of HeLa cells using SP1 (D4C3) Rabbit mAb (PE Conjugate) (green) compared to Rabbit (DA1E) mAb IgG XP® Isotype Control (PE Conjugate) #5742 (red). SP1 (D4C3) Rabbit mAb (PE Conjugate) recognizes endogenous levels of total SP1 protein. It is predicted to detect all three known isoforms. Monoclonal antibody is produced by immunizing animals with a synthetic peptide corresponding to residues surrounding Pro593 of human SP1 protein (Isoform 1). This Cell Signaling Technology antibody is conjugated to phycoerythrin (PE) and tested in-house for direct flow cytometry analysis in human cells. This antibody is expected to exhibit the same species cross-reactivity as the unconjugated SP1 (D4C3) Rabbit mAb #9389. Specificity protein 1 (SP1) is a ubiquitously expressed transcription factor belonging to the family of C2H2-type zinc finger containing DNA-binding proteins. SP1 binds GC-rich motifs with high affinity and regulates the expression of numerous mammalian genes (1,2). It interacts with many other transcription factors, such as c-Myc, EGR1, and Stat1, and with basal transcription machinery components. SP1 interacts with chromatin-modifying factors, such as histone deacetylases (HDACs) and p300 in chromatin remodeling. Transcriptional activity and stability of SP1 are regulated by post-translational modification, including phosphorylation, acetylation, ubiquitination, and glycosylation (3). Glycosylation of SP1 following insulin treatment leads to increased nuclear localization, while glucagon treatment increases cytoplasmic SP1 levels (4-6). Investigators have found high levels of SP1 in patients with Alzheimer's disease (7). Kadonaga, J.T. et al. (1987) Cell 51, 1079-90. Song, J. et al. (2003) Int J Mol Med 11, 547-53. Tan, N.Y. and Khachigian, L.M. (2009) Mol Cell Biol 29, 2483-8. Majumdar, G. et al. (2003) Am J Physiol Endocrinol Metab 285, E584-91. Majumdar, G. et al. (2006) J Biol Chem 281, 3642-50. Solomon, S.S. et al. (2008) Life Sci 83, 305-12. Citron, B.A. et al. (2008) J Neurosci Res 86, 2499-504.